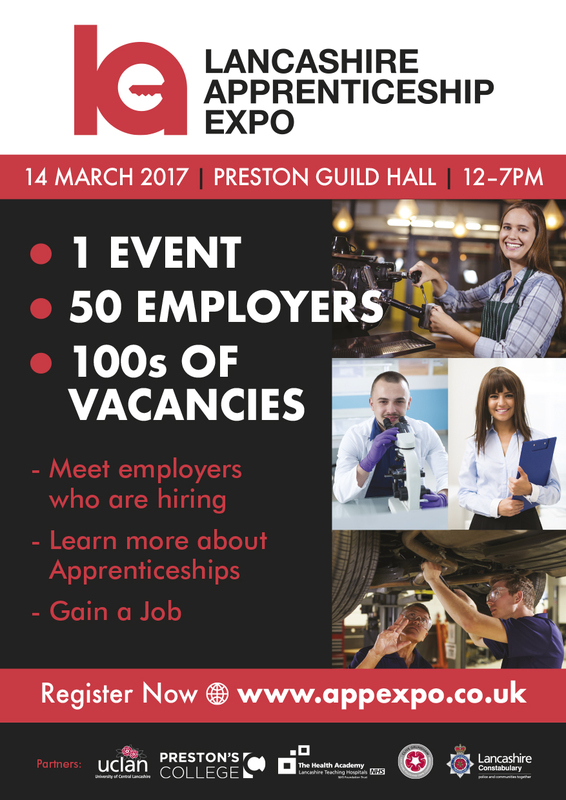 Get those CVs at the ready as the countdown begins to Lancashire’s largest ever Apprenticeship Expo on Tuesday 14th March at Preston Guild Hall. The event is ideal for school leavers, young people and adults who will have the chance to meet face-to-face with some of Lancashire’s biggest and best employers to discuss the Apprenticeships and job opportunities on offer. Around 50 businesses will be there between 12pm and 7pm with confirmed attendees including: BAE Systems, Leyland Trucks, NHS, BAXI, United Utilities, Harrison Drury, Sika and KPMG. Amongst the many Apprenticeships on offer include jobs in construction, business, engineering and healthcare. Jobseekers are encouraged to come armed with their CV to take advantage of this one-of-a-kind opportunity. The event is being run in partnership with Preston’s College, University of Central Lancashire, Lancashire Constabulary and Lancashire Teaching Hospitals NHS Foundation Trust. Andrew Richardson, lead organiser of the event, said: “This is a great chance for young people and businesses to come together and discuss job opportunities available across the county. Entry to the jobs fair is free and more information can be found at www.appexpo.co.uk including a full list of exhibitors.